HomeBlogArticlesDo You Suffer From Ringing In The Ears? Do You Suffer From Ringing In The Ears? A hearing problem does not always have to be about poor or lack of hearing. Are you one of the many individuals that experience an occasional ringing in the ears? Maybe it’s not ringing—it could also be a roaring, hissing, buzzing, or tinkling sound and it does not usually last too long. 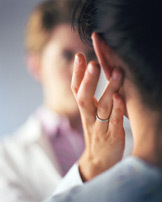 Frequent ringing in the ears with no signs of it getting better is called tinnitus. Around the world, millions of people are victims of this condition and many don’t realize that it could actually be the start of hearing loss. If you or a loved one face this problem, please be aware that relief is available, and quite easily. All you have to do is talk to the experts. Bravo Hearing Centre can help you identify such hearing loss problems and take care of all your audiometric needs. Ringing in the ears may manifest itself in many ways. Some people may hear a soft ringing while for others it can be fairly loud. You may hear it in both ears while another individual may hear it only in one ear. Whether tinnitus is just a nuisance for you or so severe that it disrupts normal life, you don’t need to live with the problem. Get the right treatment in a timely manner. Hearing loss that occurs with aging. Tinnitus is most common in people older than age 40. To find out more about the symptoms and causes of ringing in the ears, call 416-207-9711 or simply contact us.